Michael Phelps makes a very quick cameo in the season five finale of Entourage. 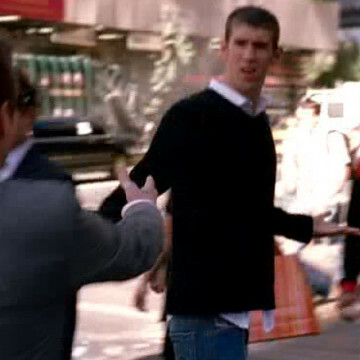 Eric bumps into Phelps as he crosses at a Los Angeles crosswalk near the episode’s eleven-minute mark. Michael Phelps is a US Olympic swimmer and appeared on the show just a couple of months after his successful run at the 2008 Summer Olympics in Beijing.